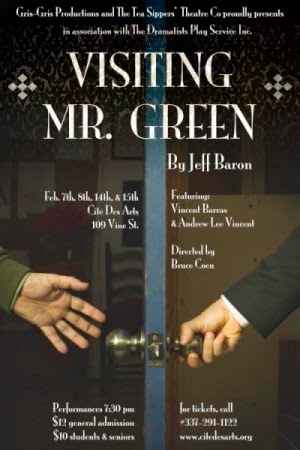 Gris-Gris Productions in a co-production with The Teasippers Theater Group proudly announces their first major play for 2014 Visiting Mr. Green. This production features 2 of Acadina's top actors. Vincent Barras as Mr. Green and Andrew Lee Vincent as Ross Gardiner and is being directed by longtime Acadiana actor, director, producer and teacher Bruce Coen. Performances are February 7-8 &amp; 14-15 at 7:30 PM at Cite des Arts, 109 Vine St. in downtown Lafayette. Tickets can be purchased at citedesarts.org or by calling 337-291-1122. Don’t miss this one of a kind performance! Get your tickets early!